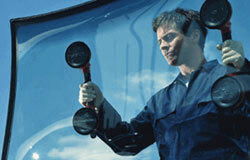 Gragan Glass has almost three decades of experience in windshield installations. We also can repair rear view mirrors, side view mirrors, door windows, and rear glass windows. We can even repair power window motors, window regulators, door locks and electrical switches. Our friendly, honest, and loyal staff can perform our services at our shop or at your home or business. All of our installers are OEM Certified. If you have just a chip or minor crack, you may be able to have it repaired at no cost to you. Call us to get the details. We also accept all insurance companies and have a lifetime warranty against leaks.